Level 2-Prep…Polish…Present takes you to the next level in the art of being what you speak. It’s a two-day mastermind group for developing and honing your material. Accelerate yourself beyond just okay and into excellence. Working on a specific presentation that just isn’t where you know it could be? 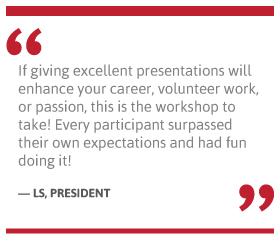 Wanting to be able to create an excellent presentation so you’re prepared next time? Developing or playing with an idea or vision that you want to share, but don’t quite know how? Needing to test your content on a group of people to get meaningful feedback and FeedForward®? Unwilling to settle for mediocre content and delivery—to move out of good enough into greatness? Want to know more? Email or call us today! Use our proven strategies to connect, engage and inspire! We believe lasting relationships start with a generous give. We want to equip you with everything you need to make your audience come alive when you speak. Thank you for your contact info. We appreciate you! Please go to your inbox and click the link to finish the subscription process and receive your free gifts. © STAND & DELIVER! ALL RIGHTS RESERVED.